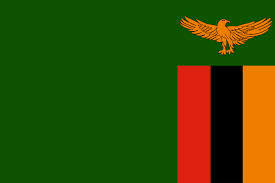 Z is for… Zambia, The end is here! It’s finally over! After some triumphs and plenty of bumps, I’ve finally reached my final alphabetical international recipe. There are only two countries in the world that start with Z, Zimbabwe and Zambia; both in Africa and bordering each other in the southern part of the continent. Finding something to cook from either country was a challenge since both cuisines rely heavily on peanuts, which I’m deathly allergic to so I was delighted when I stumbled on a few mentions of Golabjamoun, a fried sweet potato treat from Zambia. 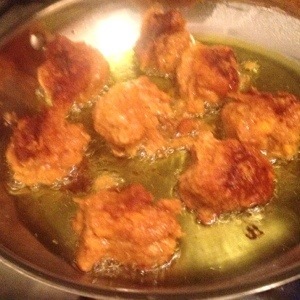 Traditionally Golabjamoun are fried in peanut oil, which I obviously needed to find a substitute for. Though olive oil isn’t the best of oils for frying, since the end of my 26 Dishes project coincided with the end of Hanukkah and it’s traditional to use olive oil on the holiday, I decided to go that route. 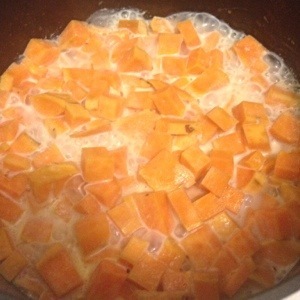 Place sweet potatoes and milk in a medium pot set over medium-high heat. Bring milk to a boil, then turn heat down to medium, maintaining a steady boil until the potatoes are very soft and milk has mostly evaporated; about 10-15 minutes (this will largely depend on how small you cut your potatoes). 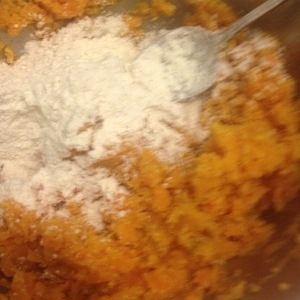 Transfer to a mixing bowl and mash the sweet potatoes in to any remaining milk until smooth. Allow to cool slightly. When mixture is cool enough to handle, add the flour, sugar and cinnamon and stir until fully incorporated. Heat the oil in a frying pan (or dutch oven with thermometer if deep frying). 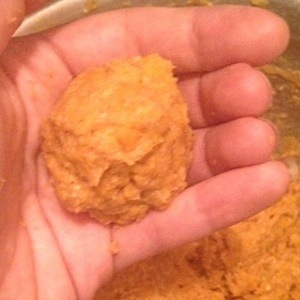 Take a bit of mixture in your hand and shape in to balls about 1 inch big, wetting hands between each and place in the hot oil. Fry until brown, flipping half way through, about 5 minutes a side. Place the finished Golabjamoun on a paper towel lined plate. Chris and I both thought the Golabjamoun were quite tasty and perfect for this season as the cinnamon was very prevalent. I had some left over cranberry sauce so I served that on the side and it paired really well. I would definitely make these again. I have a feeling that boiling these in milk is kind of unnecessary and instead you could just use left over baked sweet potatoes. Perhaps this could be a great Thanksgiving leftover recipe. I do think these would’ve been a bit better had they been deep fried, but all in all they were still delish. 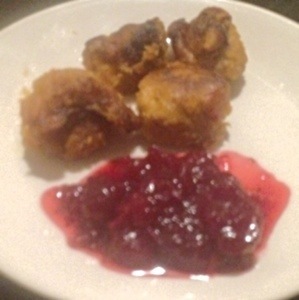 So good with cranberry sauce! This entry was posted in Uncategorized and tagged Dessert, Vegetarian, Zambia. Yea! You did it! Well done, Alli! Sounds like a fun dish and I think most people would like it but you know me and my dislike of sweet potatoes. 😉 I know, I know, I’m totally in the minority on this.